Set in Vitoria Gasteiz, this unpretentious hotel is optimal for gay people. Dato 2 guarantees a quiet stay as it counts with just 15 bedrooms. This hotel underwent renovation in 2006. The establishment includes Wi-Fi internet connection in all public areas and accommodation units. Dato 2 offers a 24-hour reception service, so that guests' needs will be fully met at any time of the day or night. If travellers ask for it, they can have a cot in their accommodation units. Guests will not be bothered during their stay, as this is not a pet-friendly property. Dato 2 provides parking for guests' convenience. A fee may be chargeable for some services. 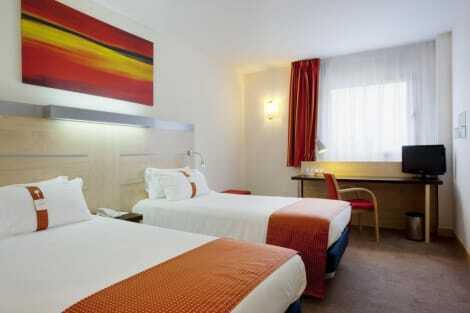 This hotel is located in the centre of Vitoria-Gasteiz. It is situated just a short distance away from the Cathedral and Florida Park. The hotel lies within easy access of the Plaza de la Virgen Blanca. Vitoria Train Station is just 350 metres away. This wonderful hotel is the perfect choice for business and leisure travellers visiting the area. The rooms are modern and functional in design. They come complete with modern amenities, including a flat-screen satellite TV. This hotel serves a buffet breakfast, for a great start to the day. Guests will be pleased by the excellent services and facilities that the hotel has to offer. Enjoy international cuisine at Quejana, a restaurant which features a bar, or stay in and take advantage of the room service (during limited hours). Buffet breakfasts are available daily from 5 AM to 10:30 AM for a fee. Jundiz industrial park hotel close to Vitoria-Gasteiz, with free WiFi and breakfast included Just off the A1 motorway, and within Jundiz Industrial Park, Holiday Inn® Express Vitoria hotel is a short drive from Vitoria-Gasteiz Old Town in the city centre. Vitoria Airport (VIT) is a 15-minute drive from the hotel. Major businesses, including Mercedes-Benz, Michelin and Omega, plus the Europa Convention Centre are a short drive away. The hotel has a meeting room for up to 20 guests, and a Business Centre in the lobby. In the city centre, you can stroll along medieval streets, visit 13th-century Santa Maria Cathedral and enjoy art exhibitions at Artium. The renowned Rioja Alavesa wine region is less than an hours' drive away, with tours easily arranged by the hotel’s helpful staff. At this hotel you can enjoy: - A continental Express Start Breakfast included in the room rate - Free WiFi throughout the hotel - Free parking The hotel offers peaceful rooms with flat-screen TVs and views of the Basque hills or nearby Arinez village. There are family rooms too, and kids stay for free with their parents. The smart lobby is perfect for relaxing over drinks with colleagues, and includes a bright breakfast area. For dinner, enjoy pintxos in the bustling bars of the Old Town or order in from one of the many nearby restaurants. Make yourself at home in one of the 46 guestrooms, featuring kitchens with full-sized refrigerators/freezers and ovens. Rooms have private balconies. 21-inch LCD televisions with digital programming provide entertainment, while complimentary wireless Internet access keeps you connected. Conveniences include separate sitting areas and microwaves, and housekeeping is provided on a limited basis. This wonderful hotel is situated in the city of Vitoria, in Spain. It enjoys a great location, lying within easy access of many of the city's main attractions. Guests can enjoy close proximity to many shopping, dining and entertainment opportunities in the area. Convenient public transport links offer ease of access to other areas to be explored. This charming hotel greets visitors with traditional hospitality and excellent service. The guest rooms are superbly designed, offering a peaceful, relaxed setting in which to completely unwind. The rooms offer modern convenience, for guests' comfort. This hotel's staff are on hand to ensure that guests enjoy a high level of service. This hotel is situated at the heart of the residential area of Lakua. It is situated just 200 metres away from Lakua shopping centre. The seat of the Basque government is just 300 metres away. Guests will find themselves within easy access of many points of interest in the area, including the nearby Palacio de Congresos. A lively nightlife scene can be found just 900 metres away. The bustling centre of Vitoria is just 2 km from the hotel. The airport is conveniently located 5 km away. This modern hotel offers guests comfortable, relaxing surroundings. The guest rooms are superbly styled, offering comfort and modernity. Guests are invited to avail of the many excellent facilities and services that the hotel has to offer. Make yourself comfortable in this air-conditioned apartment, featuring a kitchen with a full-sized refrigerator/freezer and an oven. Wired and wireless Internet access is complimentary, and a flat-screen television with satellite programming provides entertainment. Conveniences include a phone, as well as a safe and a separate sitting area. lastminute.com has a fantastic range of hotels in Vitoria, with everything from cheap hotels to luxurious five star accommodation available. We like to live up to our last minute name so remember you can book any one of our excellent Vitoria hotels up until midnight and stay the same night.